"On May 3rd my family was evacuated from our home in Fort McMurray. My husband and I are both fire fighters with Fort McMurray and were still taken back by what was happening. To try to describe how I felt as I was packing a few things from our home, or how I felt driving away from it thinking it was the last time I would see it or the horror I experienced as my husband left me in grid lock (to run back to siphon fuel from our quad) with our two year old son in the back seat as I could see flames approaching behind us, is impossible. My husband escorted me out of town as I was 9 months pregnant and the uncertainty of the next hours to days of displacement location was worrisome for someone in my situation. On our way to Edmonton I had many hours to think. I thought of thing like “what will we do if we lost everything” “will I be alone when I have this baby” and more sellfish things like “I won’t have a nice nursery to bring my baby home to” and “we won’t have any newborn pictures done for him”. The first night I stayed with a friend in Edmonton and Randy turned right around to head back to Fort McMurray . I was sad, scared and felt very alone despite all of the help that was already being offered to me. I woke up to a fb message from someone I did not know. Kristin Bakker. She sent me a message explaining that she had heard from a friend that I was pregnant and displaced and wanted to offer me a free photo shoot! I was in tears. She wasn’t just offering me free photos but rather capturing a few happy memories for my family during such a sad time. She was offering me some normalcy that I wouldn’t have thought to ask for during this awful experience. Of course I accepted and felt truly awed that a stranger wanted to help me. A few short weeks later I gave birth to my second son, Forrest Jason Hoggarth. Not long after we got to meet Kristin in person when she came to our rental house to take pictures and a video of my little family. The experience was amazing! She captured our normal day to day routine. The pictures are not only amazing in quality but she was able to freeze in time the most precious simple moments with our children. The video and pictures are something we will cherish forever. I think I have now watched the video about 30 times! Also our entire families were truly grateful to Kristin for this snap shot into our life during this crazy time as they live in Ontario and have been worried about us. I am now back home and can’t wait to hang these amazing pictures in my still standing home. I consider Kristin a friend and an extremely talented person. I want everyone to use her and experience what my family has. Thank you Kristin." You may recognize some of these people from my previous post. My cousin had me come over and take some candid lifestyle pictures of them opening presents. It was a surprise for her Mom - what fun! Loving the black and whites for this session. Also loving the sibling love - so sweet! I don't think they could get any cuter! 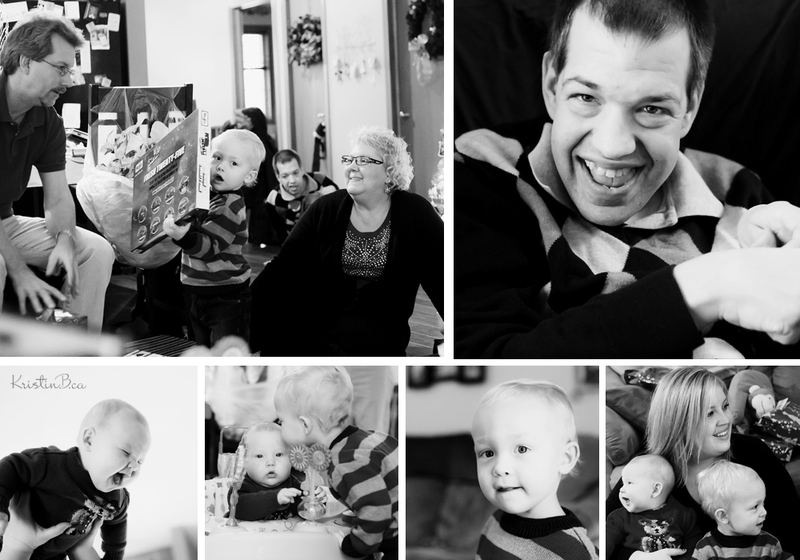 While I was in Ontario this Christmas I got to do a photo shoot for this awesome family. It was really fun! This was a gift to the Granny and Grampy from the grandkids, love that. This family picture is my favourite. Some serious cuteness going on here! I was so glad we went outside for some, it was such a beautiful winter day. Some more 365 photos - I sure love the photos I get from doing this project! A good way to document everyday life! I have known this family for a while now and it was fun to do another photoshoot with them. Two gorgeous girls they have! The younger one just turned the big 1 - so we had some fun with cupcakes, balloons and party hats. A few more from my 365 project. These are my cousin's beautiful kids. Snapped up some shots hanging around their farm on one of the first hot days of the year! Trampoline and greenhouse fun - with butterflies and bedding plants. Welcome to my brand new blog! I will be keeping you updated with recent photography sessions as well as my 365 day project I started this year. I'm excited! Hope you enjoy!